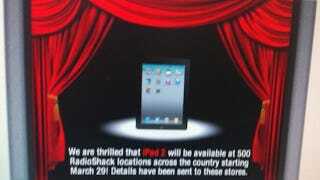 A blurry photo sent into MacRumors—and confirmation from local managers—indicates that the best place to find an iPad 2 tomorrow might just be RadioShack. Five hundred storefronts across the US will apparently be getting units in tomorrow, although don't start downloading those HD apps quite yet. While finding an iPad 2 in-store in under 24 hours certainly sounds more appealing than the 3-4 week wait for online orders, keep in mind that there are 6500 RadioShack locations nationwide, so only a small percentage will be packing. And there's no telling how many units each of those 500 stores will have. The smart money—given how hard a time Apple Stores have had maintaining stocks—is on very, very few. So either line up early and take your chances, or spend the next month planning out exactly which case you're going to get for when your iPad 2 finally shows up.